This is Ford's TracKey, a special key available to buyers of the 2012 Mustang Boss 302 that, when used, switches the dual-path powertrain control module (PCM) from streetable pony car to 444 HP track-ready stallion. Yes, the future is now. 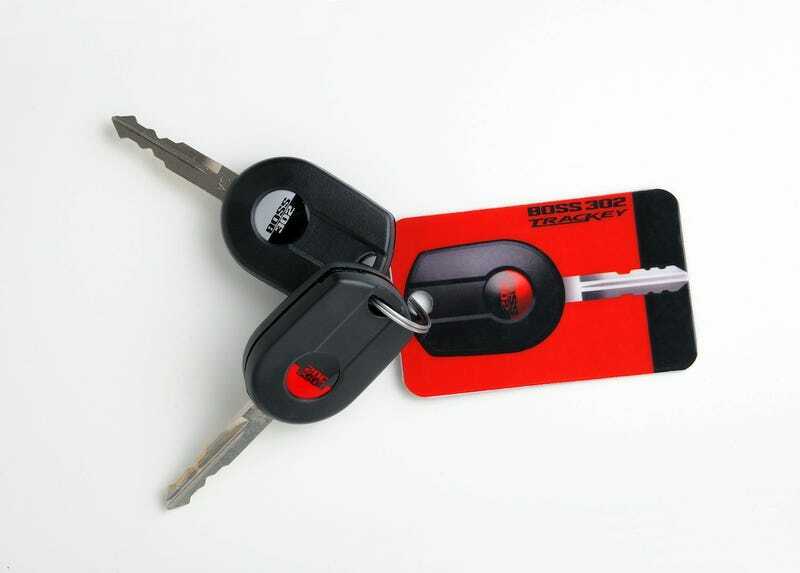 Each 2012 Mustang Boss 302 will come with an all-black key that'll work just fine to turn on your car, giving you access to 444 HP of streetable power. But, thanks to a joint project between Mustang engineers and the Ford Racing dealer network, you'll be able to buy the TracKey that'll give you a second set of PCM software instructions. This TracMode software alters more than 200 engine management parameters, increasing low-end torque and turning the Boss into a competition-ready track car — complete with a two-stage launch control feature similar to that used on the Mustang Cobra Jet. But, if you want to go back to street mode, all you have to do is start your Boss with the standard key, and your 'stang gets reset back to factory engine settings. The TracKey PCM software, installed by an authorized Ford racing dealer after a customer takes delivery of the car, adjusts variable cam timing, spark maps, engine braking, fuel control and other engine parameters – more than 200 in total – to provide a complete race car calibration. The result is an aggressive, race-bred driving experience all the way down to the lopey idle rumbling through the Boss quad exhaust. "Anything that could possibly affect all-out performance is deleted from the TracKey calibration," said Dave Pericak, Mustang chief engineer. "Throttle limiting and torque management – any daily driveability enhancements are removed and replaced with a pure Ford Racing competition calibration." We're still waiting some more details from Pericak, but what he's given us is a pretty good start. In addition to the TracKey, you'll also get a complimentary track day offered at Miller Motorsports Park in Tooele, UT. Although owners'll need to book their own travel, they'll get a chance to take the Boss out on the course under supervised conditions. I know we're really geeking out over the TracKey — but just think about the possibilities of being able to download chip tuning instructions based on the track or the type of track. You have to admit, this has some really cool possibilities.